Director/Screenplay/Producer – Larry Cohen, Photography – Fred Murphy, Music – Robert O. Ragland, Visual Effects – David Allen, Randy Cook, Peter Kuran & Lost Arts Inc. Production Company – Larco Productions. New York City detectives Shepard and Powell investigate a bizarre series of deaths where victims have been snatched from high-rise buildings and where witnesses report seeing a flying creature. Shepard advances a theory that the killings are being conducted by a flying serpent that was worshipped by the Aztecs as the god Quetzalcoatl and that it has been brought back by renewed series of sacrifices. Meanwhile, when a diamond store robbery goes wrong, petty thief Jimmy Quinn hides out in the infrastructure of the Chrysler Building and discovers the flying creature’s nest. Fingered for the robbery by his associates, Quinn instead wheedles the situation to his advantage by asking for a lengthy list of demands in return for leading the police to the creature’s nest. In bald synopsis, Q – The Winged Serpent could be any of a dozen lookalike monster movies – it does have a number of passing similarities to the low-budget film The Flying Serpent (1946), which had mad scientist George Zucco training a Quetzalcoatl bird to kill. However, any monster movie that has the name of Larry Cohen attached can be guaranteed not to be just any ordinary monster movie. Like most Larry Cohen films, Q – The Winged Serpent bubbles with an extraordinary wildness of imagery and subtext, almost to the point of overflow. In many of the numerous pickup shots of the city, Cohen, for instance, deliberately notes the striking similarity of the architecture between the flying buttresses on the Chrysler Building and the design of Aztec temples. Cohen inserts all manner of sardonic analogies between Aztec religion and modern culture: “The donor’s heart is ritually removed and presented to the gods – luckily these days all we have to do is take the water and drink the wine – that’s what I call being civilized,” David Carradine’s detective notes in one of his dry asides. 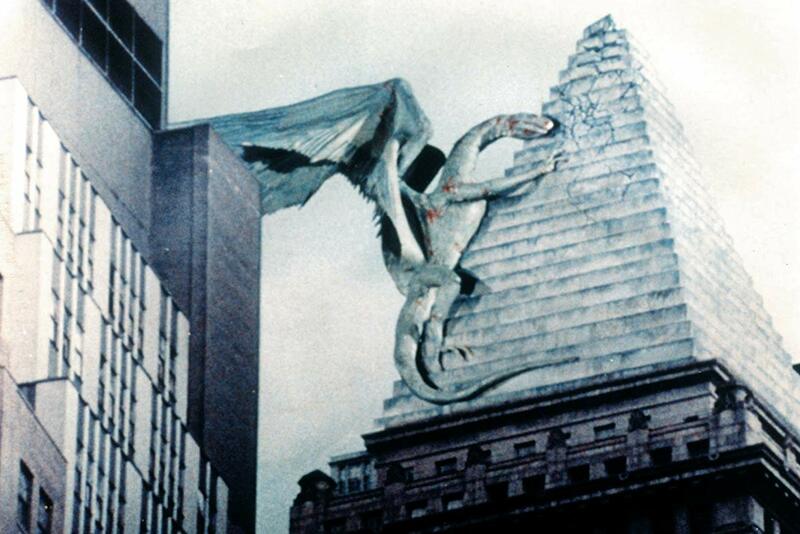 Q – The Winged Serpent works the best of all of Larry Cohen’s films. What makes it such an enjoyable film is not so much its subtext or the monster but Cohen’s sense of humour. Characteristic of Cohen’s wit is the opening scenes with a secretary exchanging flirtatious waves with a window washer while making derogatory comments about him into a friend on the phone. 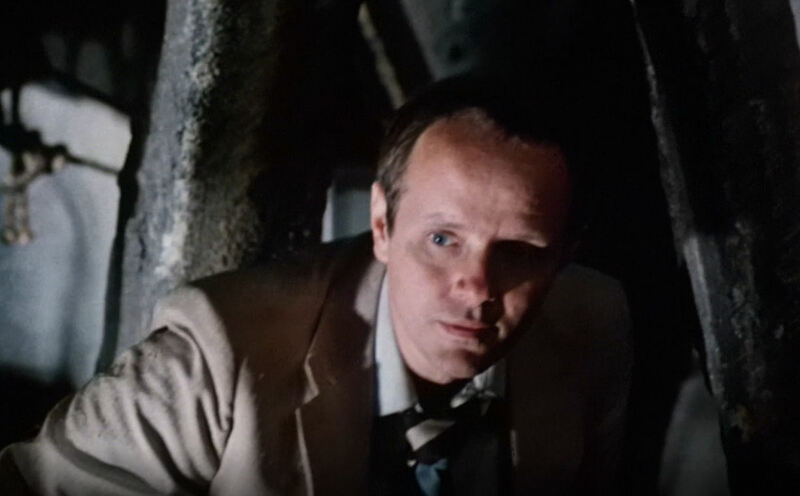 With Michael Moriarty up front, it is easy not to notice some of the other good performances. David Carradine’s slight dullness of playing and reserve is extremely well suited to that of the intellectual detective and Carradine pulls it off with grizzledly sarcastic amusement. The monster itself looks good, brought to life by a combination of stop-motion animation and prosthetics. It is kept to only a few briefly glimpsed shots so that the wavering quality of some of the stop-motion animation never destroys its illusion (apart from at the otherwise tense and exciting climax). There is one gorgeous shot where the monster’s shadow is seen winging its way across the sides of skyscrapers. Larry Cohen’s other genre films are:– the killer mutant baby film It’s Alive (1974), the bizarrely brilliant alien messiah film God Told Me To/Demon (1976), It Lives Again/It’s Alive II (1978), the werewolf comedy Full Moon High (1982), the sentient fast food takeover film The Stuff (1985), It’s Alive III: Island of the Alive (1987), A Return to Salem’s Lot (1987), the witch comedy Wicked Stepmother (1989) and the mad scientist film The Ambulance (1990). Disappointingly, Cohen appears to have dropped out from directing low-budget genre films from the 1990s onwards. Mostly he now writes screenplays. Cohen’s other genre scripts include the psycho-thriller Daddy’s Gone A-Hunting (1969), the psycho artist film Scream, Baby, Scream (1970), the deformed psycho cop film Maniac Cop (1988) and its sequels Maniac Cop II (1990) and Maniac Cop 3: Badge of Silence (1992) (all three of which Cohen also produced), the original story for Abel Ferrara’s Body Snatchers (1993) remake, the stalker film The Ex (1996), Uncle Sam (1997) about a patriotically minded undead Gulf War veteran, the hilarious psycho sperm donor film Misbegotten (1998) and the psycho-thriller Phone Booth (2002), Captivity (2007), the remake of It’s Alive (2008) and Messages Deleted (2009).